The Rural Network is a platform to gather and engage rural actors in Sweden. We are a membership based network and the members are representing various organisations and authorities which are important for the development of the activities and companies based in rural and coastal areas. All member states in the EU with a Rural Development Program are obliged to create and have a rural network. The Swedish Rural Network is linked both to the Rural Development Program and the Maritime and Fisheries Program. Both programs are funding the activities of the network. Within the rural network we are creating an arena, a venue, for mutual learning and cooperation to contribute to a sustainable development in Swedish rural and coastal areas. The cooperation is done through thematic working groups and subnetworks in specific thematic areas. Some examples are: sustainable development in the agricultural and fishery sectors and social inclusion in rural areas. Together we arrange joint activities and events like network meetings, virtual think tanks, cross sector meetings with the thematic working groups to promote learning and also to disseminate inspiring good examples to learn from. Good examples can be reached at the end of this page. 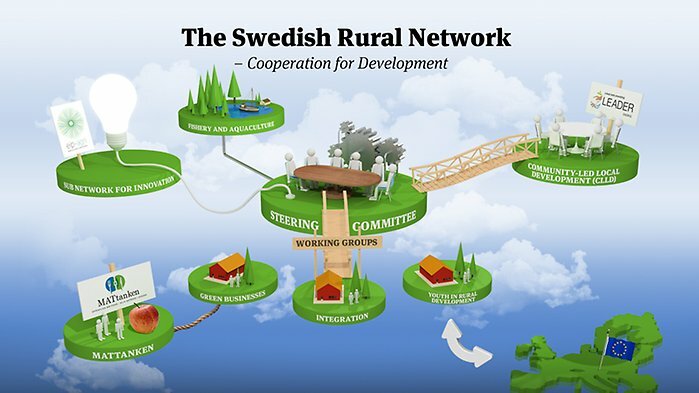 The Swedish Rural Network is also a part of the European Network for Rural Development, ENRD, with the same aim – to facilitate good development in different types of rural areas. Through the ENRD it’s possible to exchange experience and foster cooperation with rural actors in the other EU member states. In most cases our member organisations are representing the Swedish Rural Network in the activities of ENRD. Within the ENRD there is a regional network of support units from the Baltic Sea countries where we meet regularly two times a year to exchange best practice, plan some joint activities and promote transnational cooperation. Who are the members in the Rural Network? All organisations and authorities representing national interests and are important for rural development can be members of the network. This also includes fisheries, aquaculture and Community Led Local Development. As part of the network the member organisations learn from each other for the benefit of themselves and their members and as an added value they are also contributing to the common goals for rural development in the EU. The member organisations do help each other to meet the rural challenges in a better way and to use the possibilities for a sustainable rural development. The network members are able to have a say about the activity plan and can, as members in a thematic working group and with financing from the network budget, participate in the initiatives and activities given priority by the network steering committee. The base are the network member organisations. Furthermore the network consists of it’s thematic working groups, the steering committee and the network support unit. The steering committee is elected by the Board of Agriculture (Managing Authority), which has the task from the Ministry of Business and Trade to secure that the rural network is functioning well. It consists of 15 representatives from different key actors within the network reflecting the goals in the yearly activity plan and the overall common goals for the EU programs. The task is to set the priorities in the network action plan based on the expressed needs from the members and initiatives and to monitor the delivery of the networks activities. The main task of the Network Support Unit is to provide the service needed to facilitate the learning and cooperation among the member organisations participating in the network activities. The support unit has administrators handling the economy and logistics for events and conferences. There are communication officers working with the different channels for communication and also supporting the thematic working groups in their communication plans. At the support unit there are also coordinators acting as secretaries to the thematic working groups and the sub networks as well as giving the technical service necessary to get the activities running. The network support unit is led by a manager.